The third World Championships continued the quality of the first two with an unforgettable event. The USA topped the medal table with the most golds although the Soviets outperformed them in terms of medals and points. The first unified German team were a clear third but well down on East German levels. Carl Lewis, Greg Foster and Sergey Bubka won their respective events for the third time. However, it was Mike Powell’s still-standing 8.95m long jump that got the plaudits along with the US men’s 4x100m world record. Katrin Krabbe was the only double individual winner. It may have lacked the shock value of Rome but most regard the 100m in Tokyo as the greatest World Championships ever. Lewis won his third 100m gold in a world record 9.86, with Ray Stewart sixth in 9.96. 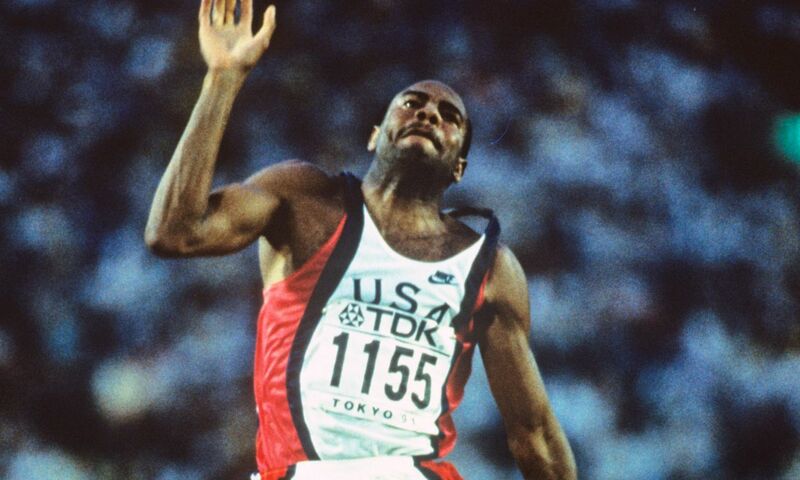 Having won his second-round race in a windy 9.80, Lewis got up late to pass previous record-holder Leroy Burrell, who had won the US Championships. Lewis and Burrell later combined to set a world record 37.50 in the relay, though France pushed them close, with Britain third. A horrible 3.4m/sec headwind may have denied Michael Johnson a world record at 200m as his 20.01 was probably a 19.5 effort and gave him victory by three tenths. USA also won the 400m through Antonio Pettigrew, who just beat Britain’s Roger Black, 44.57 to 44.62. Greg Foster actually became the first athlete to win three world titles as he edged Jack Pierce – both running 13.06 – with Tony Jarrett third. Samuel Matete, who had run the second-fastest ever 400m of 47.10 before the Games, won in 47.64. After a poor four years since his last win, Billy Konchellah retained his title at 800m. Noureddine Morceli dominated the 1500m with a staggering 51.55 last lap in a fast 3:32.84 race to win by two seconds. A brave Yobes Ondieki won the 5000m. He split the field with a vicious 59.88 second lap and was dying a death on the last lap. He just held on, though his last kilometre was 13:46 pace. Moses Tanui ultimately outkicked him. The most popular winner in Tokyo was the only non-African in this section, marathon victor Hiromi Taniguchi. His face covered in pain as he broke away at 38km, he coped with the hot and humid conditions better than his rivals did. The world junior 1500m champion Moses Kiptanui controlled the steeplechase for another Kenyan success. Maurizio Damilano retained his 20km walk title. The 50km walk was held in sauna-like conditions (97 per cent humidity) and though trying to stage a dead heat, Soviet Aleksandr Potashov got the verdict by 0.01 of a second from Andrey Perlov. Powell (pictured) stunned everyone, including himself, with his record-breaking win in the long jump (see ‘Most Exciting Contest’). Another superb quality high jump saw Charles Austin’s 2.38m shock an injury-affected world record-holder Javier Sotomayor. Dalton Grant entered at an outrageous 2.31m and cleared 2.36m but still did not win a medal! A few hours after Foster had won his third title, Sergey Bubka matched him with a quality 5.95m victory. The triple jump was closer as Kenny Harrison’s 17.78m held off Leonid Voloshin’s 17.75m. Having focused on bobsleigh the previous year, Werner Gunthor returned to defend his shot title by close on a metre. Lars Riedel surprised in his first major championship, winning the discus with his first throw. The German would go on to be an all-time great but one who already was – 1976 and 1980 hammer champion and world record-holder Yuriy Sedykh – won his first world title. Kimmo Kinnunen, son of 1968 Olympic medallist Jorma, led a Finnish one-two in the javelin while Dan O’Brien came close to the world record – effectively five seconds in the 1500m, with an 8812-point decathlon. Merlene Ottey, who had been unbeaten in 56 finals since the Rome race in 1987, was a big favourite after a windy 10.78 semi- final but she could only finish third in the final in 11.06 into a very strong 3.0m/sec headwind. Katrin Krabbe won it in 10.99 and the former East German then won the 200m in rain into a headwind in 22.09. Europe also won the 400m, taking the first four spots led by Marie-Jose Perec’s 49.13 from Grit Breuer’s 49.42 world junior record. Lyudmila Narozhilenko followed up her world indoor title with a 100m hurdles win, though Gail Devers-Roberts was only 0.04 back at the finish. The Soviets also won the 400m hurdles through Tatyana Ledovskaya, who had missed 1988 Olympic gold by easing down prematurely. In Tokyo, she needed to run through the line to win in history’s second fastest time of 53.11 to hold off Britain’s Sally Gunnell (53.16). the 3000m, outsprinting compatriot Yelena Romanova, but she failed to retain her 1500m crown as Hassiba Boulmerka held her off to win the first world gold at any event by an African woman. The marathon was not to the same standard as Poland’s unheralded Wanda Panfil beat home favourite Sachiko Yamashita by just four seconds. See British Team Performance for the 10,000m. The high jump saw one of the week’s easiest victories as Heike Henkel cleared 2.05m, with the best of the rest at 1.98m. The long jump was also top quality as defending champion Jackie Joyner- Kersee’s opening 7.32m held off 1983 champion Heike Drechsler’s 7.29m. Joyner-Kersee’s defence of the heptathlon went less well. Only just down on world record schedule after three events and on her way to a very easy victory, she pulled her hamstring in the 200m. Sabine Braun won the title in her absence. The shot was notable for Asia’s first ever world outdoor title at any event as China’s Huang Zhihong easily beat defending champion Natalya Lisovskaya. China also won the javelin as Xu Demei’s 68.78m opener defeated 68.68m by world record-holder Petra Meier. The discus saw a shock when Ilke Wyludda, who had won her 40 previous contests and was leading comfortably with a season’s best 69.12m, was ambushed by Tsvetanka Khristova’s 71.02m final round. The Bulgarian served a four-year drug suspension in 1993. There were some great track races, though it was the long jump which produced the best performance and contest. Many expected 100m champion Lewis, who had been unbeaten for 10 years, to set a world record but despite producing the greatest ever series including four PBs, he did not win gold and the record went elsewhere. Lewis opened with an 8.68m championship record and Mike Powell went second with an 8.54m second round. Lewis improved with windy marks of 8.83m and 8.91m. The latter would have bettered the 23-year-old world record but for the wind. In round five, though, Powell got it perfectly right and with a legal wind, his 8.95m erased Bob Beamon’s mark. Lewis responded magnificently with leaps of 8.87m and 8.84m but had to settle for second. Britain won two gold medals. Liz McColgan wore her competitors down with a brilliant front-running 10,000m. McColgan has been fifth as Liz Lynch in 1987 and was running just 10 months after the birth of her daughter Eilish. She immediately set a fast pace in extreme heat and humidity. By halfway (15:34.15) only world junior champion Derartu Tulu could stay with her. The Ethiopian, who would go on to be an all-time great herself, was still there at 7km but fell 80 metres back at 8km and ultimately ended up a minute back in eighth. The Scot pushed on alone and won by 20 seconds. The other gold was less expected as the 4x400m team pulled off a shocking victory against the normally all-conquering Americans. The 400m silver medallist Black put Britain ahead with a 44.7 opener but despite Derek Redmond’s 44.0 second leg, the US were three metres ahead after Quincy Watt’s electric 43.4. Many expected the US to go away as they had a good lead with the individual events bronze and gold medallist to come. However, John Regis stuck to Danny Everett and closed up slightly with a 44.22 to Everett’s 44.31. The final leg saw Pettigrew set off a stride ahead. It shouldn’t have been an even contest with Britain’s 400m hurdles bronze medallist Kriss Akabusi tracking the champion, but Akabusi followed for the first 300m, then swung wide in the straight and attacked and edged ahead in the last 30 metres and won by just four hundredths of a second. He timed 44.59 to the American’s 44.93. Britain’s seven medals put them fifth in both the medal standings and points table. While the scheduling may not have been as bad as Helsinki (that is, three rounds of 5000m) or Rome (four rounds of 800m), the lack of thought on athletes’ performances suggests the planners were either on drugs or thought all the athletes were. For example, four rounds of women’s 400m on four successive days finds out the strongest rather than the fastest. Some events could have done better with the seeding, numbers through to the next round and the over reliance on fastest losers spots. In the men’s 800m, future world indoor and reigning European champion Tom McKean was drawn in the same heat as the eventual first and third place (Konchellah and Mark Everett) and finished within three hundredths of a second of them both but didn’t even get through the first round with two automatic places.